Please be patient for pages to download properly. Why Visit A Total Solar Eclipse? For centuries, people have been awe-struck by solar eclipses. The effect of a total solar eclipse is something that can only be experienced to be fully appreciated. The effect on nature of dusk falling during the day and then a fast moving �shadow� appearing across the ground at the time of a totality, are just two phenomena that occur on earth. In the skies above, the sun�s atmosphere is visible during totality - something that is hidden from us normally, by the glare of the sun at other times. A total eclipse of the sun occurs somewhere on earth, on average, every 16 months, although the period does vary between eclipses, sometimes shorter, or longer. The eclipse shadow will very rarely occur at the same location on the earth - which means people need to travel the world extensively if they wish to view several eclipses. It is not only scientists who travel the world to view the unusual effects of a solar eclipse, but is something that has captured the imagination of many other people. In recent years, there has been greater opportunity to travel to view an eclipse with specialised tour companies. Also there have been a number of occasions - most notably Aug 1999 - where the eclipse path has coincided with large areas of population, resulting in a great interest in solar eclipse travel. 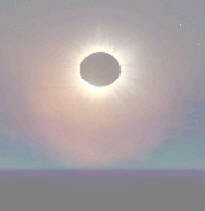 The most recent total eclipse was on 1st August 2008, and visible in parts of northern hemisphere (e.g. parts of Siberia, Mongolia, western China ). Totality lasted around 2 minutes, and there was fair visibility in some places along the path. The previous total solar eclipse was in late March 2006, when there was clear skies for an eclipse with totality lasting about 4 minutes for much of its route in North Africa and Turkey - details at 2006 total eclipse. Earlier (in 2005), there was a shorter annular-total eclipse in the South Pacific visible west of Galapagos Is. Before that, there was a total eclipse visible in Antarctica in Nov 2003. The Antarctic eclipse marked the first time humans have been able to see a total solar eclipse in this location. Click here to find out more. The next total solar eclipse will be in 2009, visible in parts of India, China and off the southern coast of Japan. This will have a very long period of totality. Favoured destinations include the Japanese islands (now accomodation almost full), and China, near the coast. Click here to find out more shortly. We advise that you do not look directly at the sun , nor use optical devices such as binoculars, to look directly at the sun, during any partial phase of an eclipse, as blindness may result. Only at the time of totality is it safe to look directly at the sun�s edge. Use eye protection at all other times.